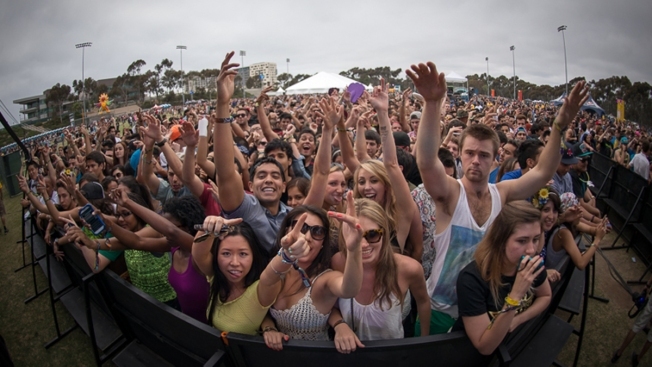 A shot of the crowd at UC San Diego's Sun God Festival in May 2013. A University of California San Diego student who was found dead last weekend has been identified by university officials as a third-year student active in the Triton community. According to a statement released by the UC San Diego News Center, the student was Ricardo “Ricky” Ambriz, a third-year Revelle College student majoring in computer science. The university said Ambriz was a member of the Phi Iota Alpha Fraternity, Inc. and the MEChA organization. “He was involved with OASIS and graduated from UC San Diego’s Summer Bridge program. He also worked in the Climate, Atmospheric Science, and Physical Oceanography business office at Scripps Institution of Oceanography,” the statement from UC San Diego said. Ambriz lived in the Village East Tower on campus. He was found dead in his room at approximately 2:30 a.m. Saturday, just a couple of hours after the university’s annual outdoor music festival, Sun God. The school’s Sun God Festival ended at midnight, but it is unknown if Ambriz attended the event, or if his death is in any way related to the festival. School officials said Ambriz’s cause of death has not yet been determined. A report had not yet been released by the San Diego County Medical Examiner’s office as of 11 a.m. Thursday. The investigation into the student’s death is ongoing. According to UC San Diego’s campus newspaper, “The Guardian,” sources said the student died in his sleep. The newspaper said some residential advisors were notified of the death in an email. The Sun God Festival happens every year at UC San Diego’s Rimac Field, and is a highly-anticipated event among students. The event features several stages and live music by well-known artists. In years past, performers have included Drake, Thrice and Kendrick Lamar. This year’s star-studded line-up included Young the Giant, Juicy J, Miner and Torro, Torro, among many others. The event is regarded as a time for UC San Diego students to let loose before they break for summer. Ambriz's death was the second tragedy to hit the university last weekend. On Saturday, night, bioengineering project scientist Dr. Anouchka Mihaylova, 62, was killed in a hit and crash in the 11000 block of Rancho Bernardo Road. She had been walking to dinner with her husband at the time of the fatal collision. She died in her husband’s arms, her son told NBC 7. According to UC San Diego, Mihaylova has been a researcher in the Cardiac Mechanics laboratory for almost 15 years. “She made seminal contributions to her field, and was an admired and revered mentor to post-doctoral researchers, graduate and undergraduate students including students in the PRIME undergraduate summer program,” the university’s statement explained. In light of both deaths, UC San Diego is providing support services and resources for all students, faculty and staff. UC San Diego’s Counseling and Psychological Services (CAPS) offers free, confidential, psychological counseling and crisis services for registered students and their parents. CAPS can be reached by calling (858) 533-3755 or visiting this website. Students are also encouraged to talk with their College Dean of Student Affairs or reach out to the Raza Resource Centro, which is also offering assistance and comfort for those affected by the losses.